US-backed fighters in eastern Syria launched a counterattack against the Islamic State yesterday. The operation came in response to a coordinated assault by the jihadists near Deir Ezzor on Nov. 23. In addition, Iraqi Security Forces are working to prevent the jihadists from fleeing across the border. The battle is taking place in the Middle Euphrates River Valley (MERV), which is one of the so-called caliphate’s last major strongholds. However, despite losing almost all of the territory it once controlled, the Islamic State continues to operate a prolific insurgency in Iraq, Syria and elsewhere. CJTF-OIR claims that there are “approximately 2,000 ISIS forces remaining,” but the basis for that assessment is not clear. It also isn’t clear if CJTF-OIR is referring to the number of fighters in the MERV, or elsewhere in Syria as well. It is possible, if not likely, that the estimate refers solely to those jihadists operating in the MERV, which is currently the main operating area for US-backed forces. The US government and other official sources have offered higher estimates of the Islamic State’s force strength in Syria in recent months. Therefore, most of Abu Bakr al-Baghdadi’s loyalists in Syria are thought to be stationed outside of the U.S. military operating sphere, which is currently centered in the eastern and northern parts of the country. This makes it more difficult for the US to estimate the group’s total membership across the entire country, as American personnel and their allies have less knowledge of the areas where Bashar al Assad’s regime and its allies operate. The Islamic State also has a cellular network in Idlib, which is dominated by rival jihadists and Islamists. A United Nations Security Council committee reported in late July that, according to some UN member states, the Islamic State’s total “membership” in Iraq and Syria is between 20,000 and 30,000 individuals. These members are “roughly equally distributed between the two countries,” meaning that there would be about 10,000 to 15,000 Islamic State fighters in Syria alone. In September, the State Department stated in its Country Reports on Terrorism 2017 that there are an estimated 6,000 to 10,000 Islamic State fighters in Iraq and Syria, though “this number was likely reduced further in 2017 military operations.” Therefore, State’s reported estimate is much lower than the figures offered by the Defense Department and in the UN’s assessment. FDD’s Long War Journal assesses that the US and partner nations probably do not know how many Islamic State fighters remain in Iraq and Syria, or elsewhere. Other indicators, including operational tempo, may provide better insight into the group’s overall strength or weakness. The Islamic State’s latest push in the MERV demonstrates that although the self-declared caliphate has lost the overwhelming majority of its territory, it retains a significant operational capacity. The group’s propaganda team remains prolific as well. 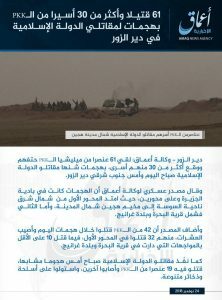 The jihadists’ most recent assault in eastern Syria was advertised by Amaq News Agency, which serves as the Islamic State’s chief “news” service. On Nov. 24, Amaq reported that “61 PKK militiamen were killed and over 30 others arrested” during the attacks in Deir Ezzor province. Citing a supposed “military source,” Amaq explained that the assault was carried out along “two axes,” with the first coming from the north toward the Hajin camp for displaced refugees and the second covering the villages of Al-Bahra and Gharanij. The Islamic State consistently refers to the US-backed Syrian Democratic Forces (SDF) as the PKK, or Kurdistan Worker’s Party, a US-designated terrorist organization. Indeed, the Kurdish YPG (or People’s Defense Units), a large contingent within the SDF, is affiliated with the PKK. Separately, the Islamic State’s media team released a video threatening SDF/PKK members and their families on Nov. 24. The nearly seven-minute long video contains grisly footage of Kurdish fighters being captured and then beheaded. Additional footage, disseminated by Amaq on Nov. 25, purportedly shows eight captured SDF fighters. The SDF published its own statement on the fighting, claiming on Nov. 23 that “27 terrorists” were killed, while two car bombs and a small “reconnaissance aircraft” were intercepted and destroyed. Other small arms were reportedly captured as well. In May, CJTF-OIR and the SDF launched Operation Roundup, which is intended to liberate the terrain in eastern Syria that remains under the Islamic State’s control. The anti-ISIS campaign has been disrupted more than once since then, as SDF fighters have been drawn to the fight against Turkish-sponsored forces in northern Syria. As the latest battle shows, the fighting in eastern Syria remains intense six months after Operation Roundup began. Where is ISIS getting it’s funding? A great question that does not get enough coverage is campaign against their finances, to include al-Qaeda and other jihadi groups in the region. ISIS as an offshoot of al-Qaeda likely receive their finances from them in AF/PAK region and other AQ affiliates in the region. The article reported they have internet coverage in Idlib; and that is what you need to communicate. They also kidnap for ransom and extortion in places they occupy. The financing of these groups has been and continues to be a significant problem since the start of the war in 2001; Saudi Arabia financed much of AQ back then and the 9/11 attacks.